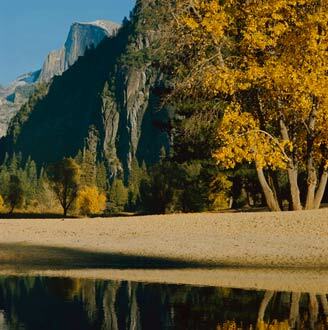 Cottonwoods, Merced River, Fall, Yosemite Valley, Yosemite National Park, Sierra Nevada, California, copyright 1973 by Philip Hyde. This is the original 2 1/4 Hasselblad framing. 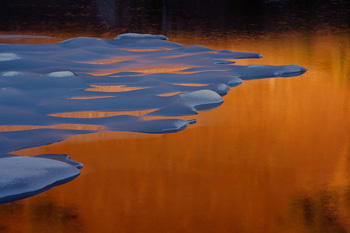 Philip Hyde often cropped his 2 1/4 photographs to 4X5 dimensions and composed accordingly. Click on the image to see it larger with the 4X5 cropping. Cooool this morning! – Very hot Sunday and Monday, but more like May on Tuesday. I’m really enjoying this workshop. Lots of talk – some interesting people and especially enjoying my “colleagues” and getting acquainted. Doing plenty of talking myself – a “loosed tongue.” Learning something. Workshop seems pretty well organized. I’m having trouble sleeping – being “over-stimulated” I guess. Went to bed around 11 pm. Woke up at 5:30 this morning and not tired. This is really good for me!!! 😉 Not just the shorter sleep, but stimulation, talk, interchange, etc. Yosemite Falls brimming – I can hear its thunder from my room at night – a pleasant kind of noise, not distracting… I think now I might stay a day or two here as I won’t be making many pix while workshop is on. But more of that later. Well, here I am again! To bed last night after a critique until 1:30 am. Awoke at 6 am and couldn’t sleep any more, so here I am waiting for Steve Crouch to come by the room so we can have breakfast together. It’s Sunday morning and after breakfast I’ll check out and go over to the Gallery for a farewell session with everybody. It’s been a very full week and at this point I’m a little tired but still exhilarated. I’ve enjoyed the exchange with people immensely and think it’s been very good for me. The group has been a very heterogeneous collection of people and that’s been stimulating. There were also some whose talent stands out and that is a miracle to me to observe. In sort and in all it’s been an experience I was ready for and needed and I feel like I have done something with it. For once I haven’t been frantic to make photographs but seemed to be aware on many levels of consciousness what I was really here for. Perhaps – or maybe I should say – surely my photography will benefit far more by this than if I had merely made pictures on this occasion. Gotta go – love to you two. It’s 8:15 pm and I’ve just finished the dishes after dinner. It was good talking with you two tonight. I’m enjoying my stay in this beautiful place that has meant so much to the Hyde family. It never palls on me and always seems that there’s more that I haven’t seen before. This morning Jim Speer and I walked up from the campground along the river to Happy Isles. As always I found lots to photograph and I really enjoyed having Jim along too. This week has been a monumental talk fest and I’ve thoroughly enjoyed it! Though there were all levels of accomplishment and ability, everyone was serious and interested in photography. I feel that I got completely out of my usual – I should say, former self-consciousness. I relaxed and enjoyed the people and the interchange. Jim told me he thought I am an extrovert! Funny how the barriers come down when you forget self and stop worrying about what other people are thinking about you. I could do this in our sessions, even when I was talking about my work, career, experiences, etc. Many people commented on the good mix of personalities among the four staff and I think, too, that it made for a more interesting interchange for the students – though, unfortunately we didn’t really have a lot of chance to talk with each other, except sometimes at meals and odd times. I sat in on a Steve Crouch critique and several of William Garnett’s critique sessions. Though not actually scheduled for any myself, after the first day or two, people began asking me if I’d look at their work. I ended up having unscheduled critiques three of the evenings. I enjoyed this, particularly since many of them were young people. I’m now going to make an astonishing statement: I think I would enjoy teaching! Not full-time, but as a periodic thing – a change of pace and a kind of recharging of my own interest. I can already feel changes there. 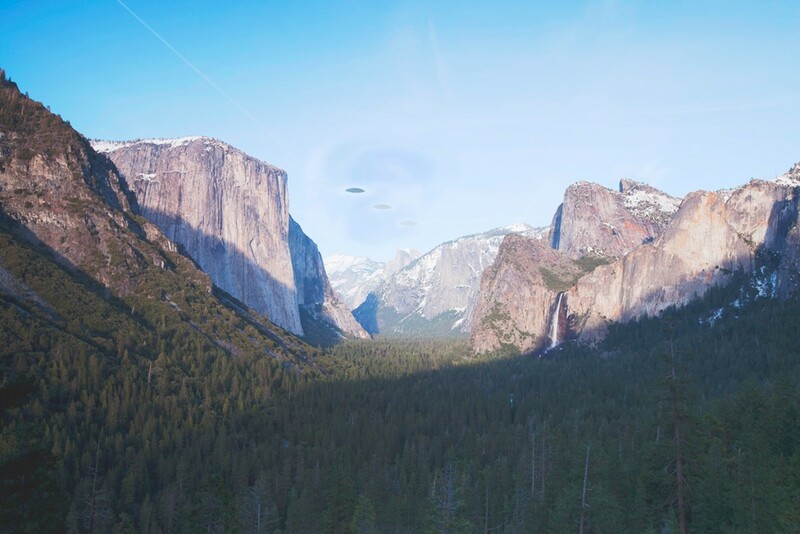 Of course, some of this is the magic of Yosemite – but it is also the magic of getting rid of the feeling that I don’t like people. That feeling was never really part of me, or natural to me, and I feel that “the scales have fallen away from my eyes.” With more openness and generosity toward people, it’s wonderful to see how they respond. I feel like a great weight of negativism has been taken off me. Surely I’m not the same now after this experience. How good that I saw it as an opportunity and didn’t shrink from it. May I have good judgment to recognize such opportunities in the future. Another thing this whole experience teaches me is that I need this kind of interchange for my own growth. It is Spring here in more ways than the obvious – your shrinking violet has bloomed, Love. It’s a sweet scent and I have such a good feeling about it. What a phenomenon. Well it’s getting on toward 9 pm and I’m going to be early and will start early in the morning. The afterglow is gone from Half Dome, which I see clearly from my campsite, but the afterglow is still in my heart. What is your experience? Have you ever been in a social or learning situation where the human interaction inspired or changed you creatively or otherwise? 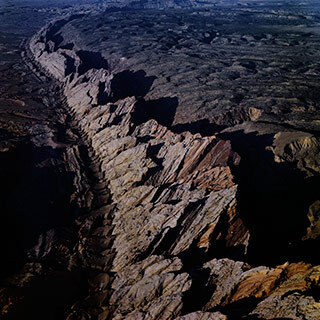 Aerial Of San Rafael Swell, Utah copyright Al Weber. Al Weber was born in Denver Colorado in 1930. He received an A.A. in photography and a B.A. in Eduction from the University of Denver and served as a Captain in the Marines during the Korean Conflict. After his military service he moved to the Monterey Peninsula and established himself as a commercial photograph. Weber’s career spans six decades. He is internationally recognized for the breadth of his work and contributions as a teacher and mentor. 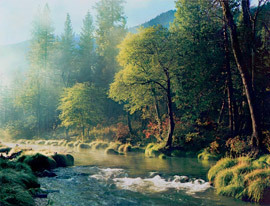 Weber’s images have been shown in over 200 exhibitions. An accomplished commercial photographer, his commissions include work for Time-Life, Fortune and Holiday magazines. Corporate clients include Dupont, Kaiser, International Harvester, Eastman Kodak, Polaroid and Hasselblad. His photographs are in the permanent collections of The Art Institute of Chicago, M. H. de Young Museum, UCLA, Utah Museum of Fine Arts and the Ansel Adams Collection. My daughter-in-law, Sara, was talking on her cell phone as I walked into the living room. From there into the dining room, a distance of 20 feet, was my son, Robert, sitting at the table and also talking on his phone. They were talking to each other. At the airport in El Paso, a group of teenagers sat nearby in the waiting area. They were talking to each other on their cell phones. Approaching Winnemucca, Nevada on Interstate 80, already driving substantially above the speed limit, a car passed me. They were really hauling. The driver was on his cell phone. In line at the post office, John Livingstone was talking on his phone. He didn’t really need a phone as everyone in the building could hear him. Cruising the aisles in Safeway, a man blocked others as he got instructions, via his phone, on which brand of tomatoes to buy. On TV, a man dressed in blue jeans with no belt and wearing a T-shirt introduced a new electronic gadget at a San Francisco trade show. I’m told he is a genius. His name is Jobs. Now I’m told his gadget is faulty. What do you expect from someone who dresses like that? Twelve weeks at Parris Island might straighten him out (Marine boot camp). Growing up in Denver, I remember our telephone. It quietly sat there on a recessed shelf by the front door. It rang a few times each week. Someone always answered it. Today, rarely do I reach a real person when I place a call. Push this or push that. They’re always out or on the other line. “Your call is very important to us…..” If it’s so important, why don’t you just answer the phone? Of all the people who should be competent with a telephone, AT&T seems obvious. My darkroom phone quit and Suzie called for service. The Keystone Cops or maybe the Marx Brothers couldn’t be funnier. Almost an hour of press this or press that, then several hang-ups and finally a recording offering a repair man in 5 days, who would arrive somewhere between 8AM and 8PM. No one, it seems has one telephone. They’re all over the house. And then there is ‘Call Waiting’ and blocked numbers and on and on. We live in a frenzy dominated by telephones. The time wasted, just waiting for that call back, is maddening. The advertisement says, “Just ask your doctor”. Who are they kidding? The cardiologist I go to may be very smart when it comes to fixing my body, but he can’t seem to figure out how to use a telephone. Neither can his receptionist. The only people skilled in telephone use are the marketers, always at mealtime of course. It appears this man Jobs contributes mightily to our plight, our uncontrollable attraction to a complicated, expensive device that has become more of a toy than a tool. But it’s so magnetic, and the colors are so cool. There are so many functions and it makes us feel so hip. I’d like to suggest one more function to Mr. Jobs. Bring back the reliability of the old telephones. El Capitan, Clouds, Fall, Yosemite Valley, Yosemite National Park, 1973 by Philip Hyde. Made while visiting Yosemite Valley to teach at the Ansel Adams Gallery Workshops. 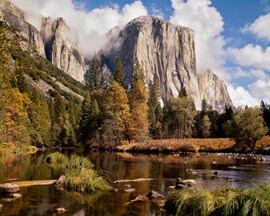 New York Life Insurance made this Yosemite classic into a poster. The New York Life logo was taken from the outline of El Capitan in this photograph. In 1952, two years after Philip Hyde had earned a certificate of completion from Ansel Adam’s Photography Program at the California School of Fine Arts; Minor White, lead instructor, asked him to return as a guest lecturer and guest teaching assistant. In the summer of 1968, the Ansel Adams Gallery invited Philip Hyde to attend an Ansel Adams Gallery Workshop taught by Ansel Adams and others. The next summer Philip Hyde became a teaching assistant and by the early 1970s, Philip Hyde was a co-instructor with Ansel Adams and other luminaries in various workshops such as Morley Baer, Dorr Bothwell, Norman Locks, Alan Ross, Dave Bohn, Yousef Karsh, Bob Kolbrenner, William Garnett, Steve Crouch, David Cavagnaro, Roger Minick, Ralph Putzker, Arnold Newman, Wynn Bullock, Jerry Uelsmann, John Upton and others. 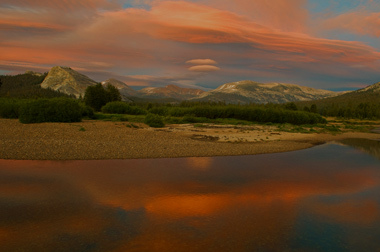 Philip Hyde sometimes taught the Ansel Adams June Workshop with Ansel Adams and other instructors, other years Philip Hyde co-taught the Color Workshop and some years he taught both workshops. 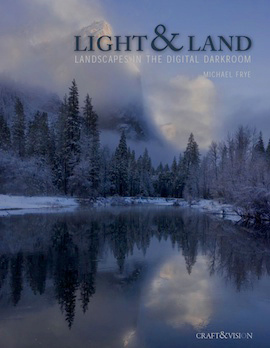 Philip Hyde also taught photography workshops for such organizations as the Museum of Northern Arizona, Friends of Photography, John Sexton, Morningbird Ranch, Sierra Photographic Center, Tahoe-Truckee Photographic Workshops, Utah Museum of Natural History, UCSC Extension, Anderson Ranch, Ray McSavaney, Point Reyes Field Seminars, Sea Ranch, Yosemite In Winter, Kenab Workshops, Piet Van de Mark, Owens Valley Photography Workshops, The Alaska Photographic Workshops and Nature Photography Expeditions International.